Weddings Costs > How Much Does the Average Wedding Dress Cost? One of the most important decisions the bride-to-be will have to make is which dress to choose. There are so many factors that affect the pricing of a wedding dress (see our factors below). Simple dresses can be as little as $100 to as much as $10,000 for a name brand extravagant dress. A machine-made dress that can be found at local retailers will usually cost $100 to $600. Usually made of a synthetic fabric, there isn’t much in terms of detail. A wedding dress that is made from a natural fabric can cost anywhere from $1,600 to as much as $5,000. This type of dress will include minimal hand detailing and can be customized to size. There are many dresses that can be found for $100-$500 for those who may be on a budget. David’s Bridal, for example, has hundreds of dresses in stock which are priced $500 or less. These dresses will be machine-made and will come in sizes ranging from a size 4 to size 16. Dresses that are under the $500 mark are considered to be on the lower end. Dresses made by famous designers, such as Alfred Angelo, can cost between $500 and $3,000 depending on the intricacy of the design and the popularity of the style. These dresses are made specifically for the person purchasing them and come with many options such as size, length, and zip- or lace-up backs. Mid-range dresses are going to cost anywhere from $500 to $2,500. Dresses can also be handmade by a personal designer. This is the best way to get the perfect fit since the designer will take all your measurements, not just your waistline. Hand-made dresses also ensure the highest quality embroidery and decorations chosen by the bride herself. Dresses such as these will usually cost $4,000-$6,000. Websites, such as DressFinder.com, can help you search for a personal dress designer. According to a forum thread on the website WeddingBee.com, members claimed that wedding dress prices ranged anywhere from $200 to as much as $2,600 for their dress. Fox Business states the average wedding dress is $1,100, according to experts. Styles can commonly include the following types: beach-type, chic, modern, classic, elegant, luxurious or dramatic. Colors may include ivory, white or a diamond white. Dress lengths can be as high as the knee or along the floor. Common fabrics include charmeuse, lace, net, organza, satin, silk, taffeta and tulle. If a train is included, the type can add to the cost. Common types include a cathedral, chapel, court and short. Some dresses may have sleeves, while others may not. Sleeves may be considered a cap, sleeveless, spaghetti strap or tank straps. How is the back designed? Common designs may include a corset, button loop, zipper or inner corset. The more details that go into the dress, the more it can cost. Details may include beading, belts, bows, draping, floral, lace, pleats, ruffles, and sashes. In addition to the actual dress, many stores have a satisfaction guarantee, meaning that if something happens to the dress or you are unsatisfied in any way, they will do their best to fix the problem. Most dress stores would prefer to uphold a good reputation and will do what they can to help you. Usually included in the price of a dress is a heavy carrying bag to protect the dress from weather and other unforeseen accidents. Most wedding dress boutiques will include an assistant that will recommend dresses as well as assist you with trying them on. Measurements will also be taken once a dress is picked out so that it can be ordered. Bridal dresses can be found at designer stores, national chain bridal chains, trunk shoes, department stores and via online retailers. Unless you purchase a dress from a personal designer, you will probably need some type of alterations done to the dress in order for it to fit you perfectly. Wedding dress alterations can run anywhere from $50-$300 depending on the amount of work needed. If you choose a dress that is meant to be full below the waist, an extra piece can be purchased to add to the body of the dress. This piece can cost $30-$100. Some stores charge extra for plus sizes, which usually start at size 16. Rush fees can apply to those that need to dress fast. It’s essential to have the dress ordered well ahead of the wedding to avoid this issue. Well-known designers can cost a lot more than a local designer. If the designer is in demand, their prices can be a lot higher. Additional accessories may be required such as a slip and headpiece to match. Each item will widely vary depending on the quality. Ask your officiant in regards to the dress code. Some churches may have a dress code that the bride shall adhere to. The best time to dress shop is during the weekdays. Consider setting up an appointment Monday through Thursday in the afternoon. Always try to shop with more than one dress boutique. Most will recommend that two to three shops are considered before making a decision. 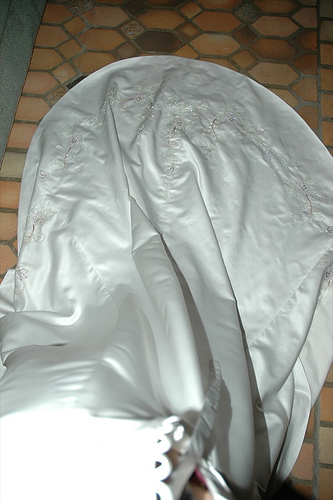 Because wedding dresses are usually only worn once, many people choose to sell their dresses when they are finished with them. Websites, such as recyclebride.com, offer gently used dresses for discounted prices. There are also many local stores that sell pre-owned dresses if you do not want to buy a dress online. Don’t forget to check out websites like eBay as well. You would be amazed at the deals that can be found here too. Some stores may offer deals if you purchase all of your dresses for your wedding party from them. Check with your local store for more information. Consider buying floor models through various stores. This alone can help save more than 75% on purchases. For those on an extreme budget but want to buy new, LightInTheBox.com is an amazing place that has wedding dresses for less than $150. Renting a dress may be an option for those who don’t want to keep their dress after the wedding.